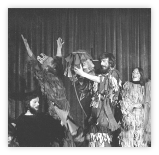 Green Branch productions have ranged from opera to pantomime and from folk operas to plays with music, many of them with themes drawn from Celtic mythology. Formed nearly forty years ago by the West Country composer Tim Porter, who has written most of the company's material, the company existed in various forms before adopting the name Green Branch. Some of the works are available for performance by other companies, and scores, orchestral parts and scripts can be supplied by arrangement. "In Celtic mythology, the Red Branch was a brotherhood, whose members had certain ideals. They were not unlike King Arthur’s knights, who, it will be remembered, struggled to preserve Britain’s heritage in a barbarous age, and transmit it to those who came after. The Green Branch has more peaceful methods (music and drama) but our aims are similar. We state, without necessarily pretending to understand, certain essential themes which too often go unregarded in this strange century, when "myth" has come to mean "untruth" - the exact opposite of its actual meaning. The specific strength of the Green Branch as a theatre company lies in its adaptability and resourcefulness. 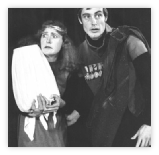 Distinctions between actors, singers and instrumentalists are blurred, and roles often intermingled, thereby making use of all available abilities. The importance of music in the company’s work helps give Green Branch Theatre the individual style which sets it apart from other fringe companies. Reflecting the wide variety of mood and subject matter in mythology, the company’s productions have ranged from the intense and tragic "Trystan and Essylt" and the complex opera-within-a-play "The Irish Blackbird" to "The Marvels of Merlin", a light-hearted pantomime, and the folk operas "Sir Gawain" and "Robin Hood". Mediaeval tradition is represented by "The Story of the Rood", a version of the Cornish Mystery Cycle, and an opera based on Chaucer’s "Parliament of Fowls". 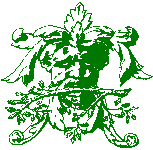 The Green Branch emblem of the Wodwose or Green Man serves as a reminder of Britain’s ancient heritage, which constantly takes new shapes, but which always remains alive."